Status: offline In my first game I wanted to repair a railroad, so looked for a unit with that capability. I found a rail repair unit, but to my surprise saw that it did not have the rail repair special ability. See the screenshot for the explanation. Perhaps it's nothing new to veteran players, but I found it enlightening. In my first game I wanted to repair a railroad, so looked for a unit with that capability. I found a rail repair unit, but to my surprise saw that it did not have the rail repair special ability. look at the equipment... RR repair crews ;) There ain't a special RR Repair icon. You also can dump RR repair crews in higher echelon HQs, engineering units, etc. and they are capable repairing RRs. Status: offline The rail repair capability ticks down to zero as you move because if you have no movement points you can't repair rails. The chance for success is evidently based on the number of movement points left, yes? The icon displayed on the unit is a RR Repair icon for, yes, RR Repair units. But the RR Repair squads can be a part of any unit thus giving any unit a RR Repair capability. It would appear that any engineering efforts success is dependent on the number of movement points left, yes? The more it moves the less time it has to complete an engineering effort. Status: offline It's an elegant implementation, IMO. I haven't yet figured out how to place rail repair crews in other units in game - perhaps only with the editor? It's an elegant implementation, IMO. I haven't yet figured out how to place rail repair crews in other units in game - perhaps only with the editor? Status: offline I've noticed that rails get broken if you travel in a hex with a rail. Does that sound right? I've noticed that rails get broken if you travel in a hex with a rail. Does that sound right? Status: offline I moved an anti tank unit onto a good rail and it broke it. Very annoying. I moved an anti tank unit onto a good rail and it broke it. Very annoying. Greetings to the Commonwealth of VA! I did mention the importance of keeping the LOC/LOS open at one of my tutorials; check them out anyway; I am sure it's the Tutorial '43 one. Status: offline I'm not entirely convinced about this. If you have time to do this kind of things, you do. But sometimes you don't. Disastrous routes or very quick retreats could leave you no time for that, or maybe there simply isn't specialized equipment at hand, so whatever damage you can do can be repaired without specialized units. 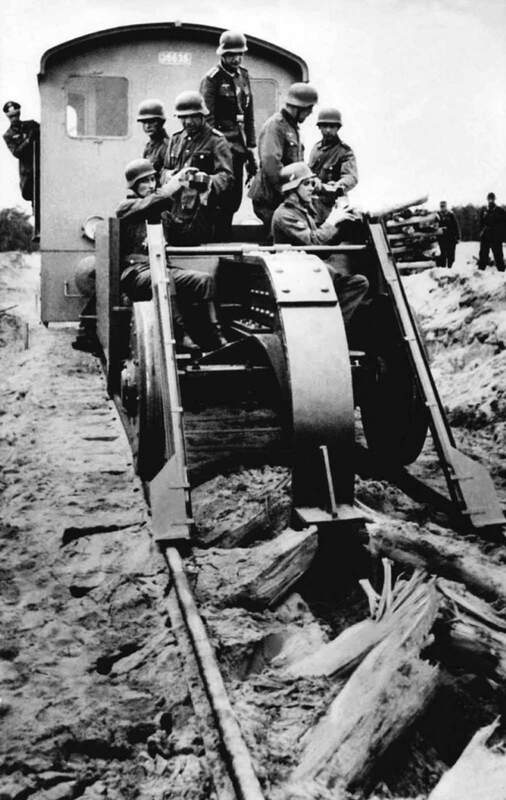 Not every railroad in WW2 or other wars has been properly destroyed by enemy forces while retreating. Or maybe there isn't even any kind of unit around to do anything: if i manage to make an amphibious landing way behind enemy lines with no enemy units around for tens of miles, how could the rails be broken by anyone? BTW the implementation of rail repairs is really elegant and makes 100% sense: if you use your "time" to move, you won't have time to do proper repairs. Just brilliant. Status: offline Destroying the rails isn't the only way to cause chaos to a rail system. Burning support infrastructure and small bridges can do the same thing. Saying a nations rail is only the tracks is far from the truth. 1. Destroying infranstructure while retreating was pretty standard thing in IIWW. 2. Sabotage (partistant or SF) also was quite common and sometimes had serious effect like in Prypat Marshes in 1943-44. The option of Recce unit or armoured unit advancing into enemy territory and destroying infrastructure is not very realistic. Just like blowing of bridges by a company tanks. But on the other hand, as Lobster mentioned, you did have many small, wooden bridges or railway infrastructure like water tanks (which ate not represented on the map) that could have been destroyed when retreating. Just to make something abundantly clear: very rarely the goal of counterattack was to destroy an enemy railway as it was easier and more efficient to use planes and/or saboteurs. But if the unit knew they have no chance of keeping the ground they would try to destroy as much as possible on withdrawal. Plans are worthless, but planning is essential. Status: offline Remember that the rail destruction rate is variable by event. It doesn't have to be 100% if you think that is inappropriate. Status: offline Bob does this mean it can be modelled that only non-armored units can cause rail destruction? Bob does this mean it can be modelled that only non-armored units can cause rail destruction? No. Don't forget that it isn't normally the unit that enters that causes the damage. It was the enemy that damages it in advance of the occupation - to prevent the advancers from benefiting from the line. And just because there wasn't any enemy combat unit present in the hex before the advance doesn't mean there weren't non-modeled, non-combat elements present. I'm struggling to understand one thing. The hardcoded (in game or in scenario) rail damage system is somehow effected by partisants rules of the scenario? If I choose not to play with the partisants does it affect that? Or this depends on scenario design? The partisan effect will toggle hex ownership in some random places. That will break rail in those hexes just like any unit would that entered them.